The Venerable Denma Lochö Rinpoche was born in Kham, eastern Tibet, in 1928. At the age of six he was recognised as the reincarnation of a famous yogi, Chöying Gyatso. He entered Drepung Loseling Monastery at the age of eleven. Rinpoche received his Lharampa Geshe degree in 1953 (coming first in his class) and completed his Tantric exams at Gyume Tantric College in 1958. 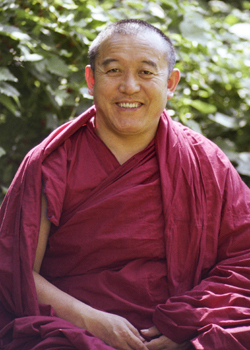 He received many teachings from the late Venerable Ling Rinpoche (the senior tutor to His Holiness the Dalai Lama) and became the main lineage holder of all his teachings. 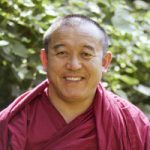 Khensur Denma Lochö Rinpoche ceased breathing and entered into clear light meditation on Thursday, October 23, 2014 at his home in McLeod Ganj, India, after a brief illness. Click here to read Rinpoche's autobiography. A teaching by Denma Lochö Rinpocheon on the conventional or surface level of truth and the ultimate truth given in Bodhgaya, India December 1995.